The People's Pharmacy Guide to Home and Herbal Remedies. The People's Pharmacy Guide to Home and Herbal Remedies. They made the drugstore a safer place. Now America's most trusted consumer health authorities provide wise guidance on the safe use of home and herbal remedies. The Graedons (The People's Pharmacy, 1976, etc. ), newspaper columnists and radio-show hosts, are right up-to-date on what is known about herbal treatments; from interchanges with their devoted public, they also offer suggestions for help via popular folk remedies. They begin by listing 20 of their favorite home remedies, those we have either tried ourselves with good results or heard about repeatedly from readers . . . in some cases, there is scientific research to back up the folk wisdom. Included here are gin-soaked raisins for arthritis (take nine per day), and Archway Coconut Macaroon cookies for treatment of diarrhea (a remedy first suggested by a Crohn's-disease sufferer), as well as the more familiar ginger tea for colds and coffee for asthma attacks. The Graedons warn early and often of the possible dangers inherent in herb use, particularly in combination with prescription drugs. Some of the most dangerous herb-drug interactions they document: licorice and Lanoxin (the potassium- depleting properties of licorice can cause heart arhythmias); kava-kava and Xanax (both are sedating; together, they are dangerously so); and ginkgo and Coumadin (increased risk of hemorrhage). The authors also remind us that no one, inside the government or out, monitors herbal preparations. 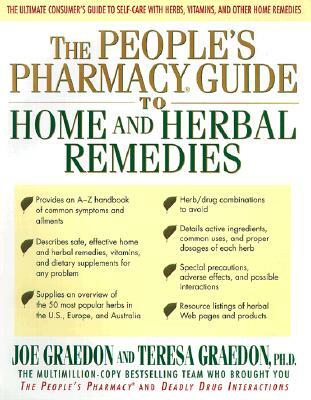 Title: The People's Pharmacy Guide to Home and Herbal Remedies. Keywords: HEALTH REMEDIES. CURES. HERBAL. SIDE EFFECTS. DRUGS.